A Quw'utsun wood carver intently focuses on his latest creation in the Cultural Centre in Duncan on Vancouver Island,British Columbia. The Cultural Centre has many different interactive displays where people can watch artwork and other objects being created using traditional methods. Wood carver in Quw'utsun' Cultural Centre, Duncan, Vancouver Island, British Columbia, Canada, North America. 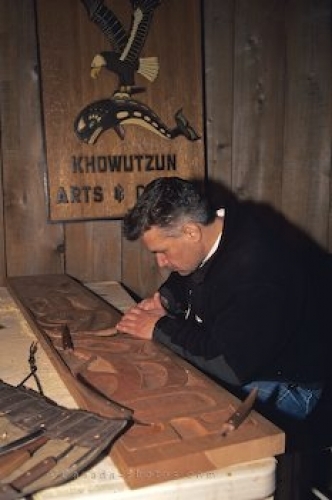 Picture of a wood carver in the Quw'utsun Cultural Centre on Vancouver Island, Canada.